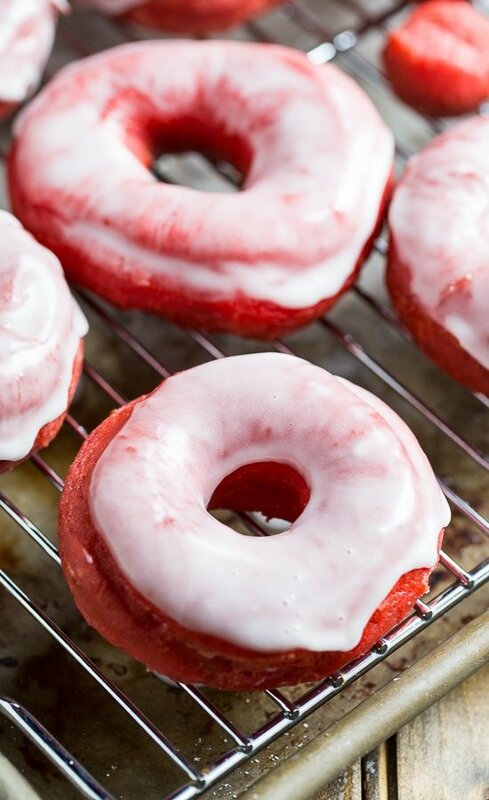 These Red Velvet Donuts with Glaze are made from scratch and have a hint of cocoa and vanilla. I love to enjoy Red Velvet year round, but Valentine’s Day practically requires that something red velvet be made. I like to have fun with Valentine’s Day breakfast and this year I am planning ahead of time. Last year we had Red Velvet Pancakes with Cream Cheese Drizzle. Pancakes are my favorite and I totally devoured them. This year I want to do donuts so I tried out a recipe from a cookbook I got for Christmas The Red Velvet Lover’s Cookbook: Best-Ever Versions for Everything Red Velvet, with More than 50 Scrumptious Sweets and Treats . This is actually the first time I’ve eaten a red velvet donut so I can’t compare them to others, but I thought they were pretty darn good. My kids remarked that they taste kind of like funnel cake. 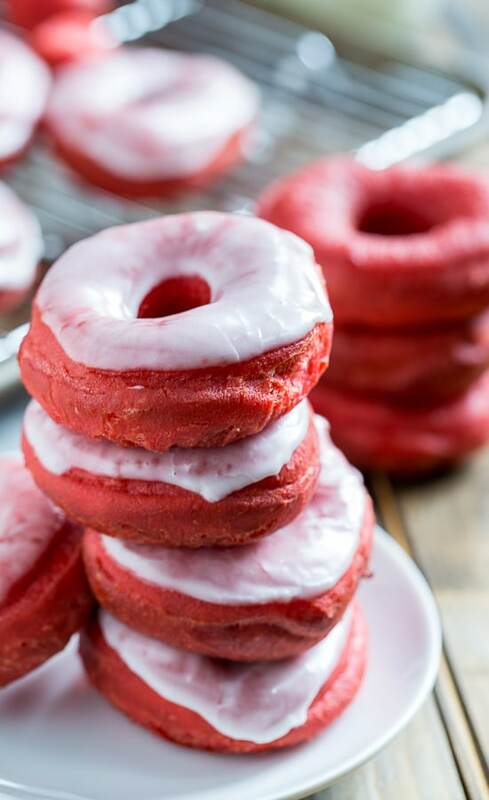 These Red Velvet Donuts are fried, not baked. It’s a day for indulgences isn’t it? They are covered in a sweet glaze, but now I am wishing I had made a cream cheese frosting for them. Red velvet is kind of naked without cream cheese. 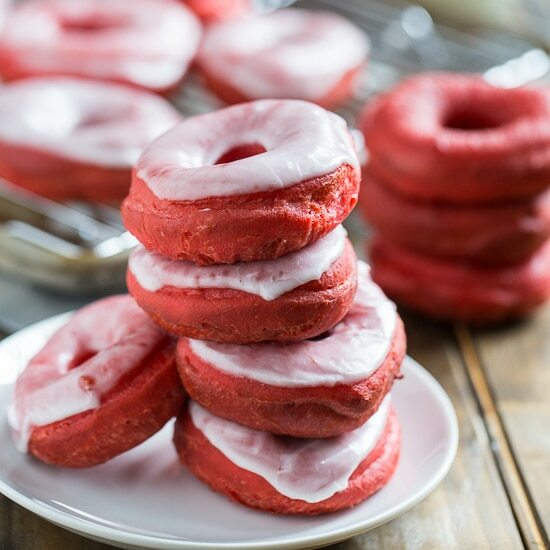 But regardless, won’t your kids think Red Velvet Donuts are a real treat for Valentine’s Day? Stir the yeast into the warm water and let sit for 5 minutes. In a mixing bowl, combine milk, sugar, and salt. Using a mixer with a paddle attachment, beat in eggs one at a time, stopping to scrape down the sides of the bowl after each addition. Beat in shortening and 2 cups of flour. In a small bowl, stir together cocoa powder and food coloring to make a paste. Add food coloring paste to dough and mix well. Keep adding flour, 1/2 cup at a time, until dough begins to pull away from sides of bowl. Switch to a dough hook and knead dough for 5 to 8 minutes, until soft but not sticky. Place dough in a lightly oiled bowl, turning dough to coat it in oil. Cover bowl with plastic wrap and let rise until it doubles in bulk, about 1 1/2 hours. Fill a Dutch oven with about 2 inches of oil and heat to 350 degrees. Cut dough into four pieces, and working 1 piece at a time, roll dough out on a lightly floured surface to a thickness of 1/4-inch. 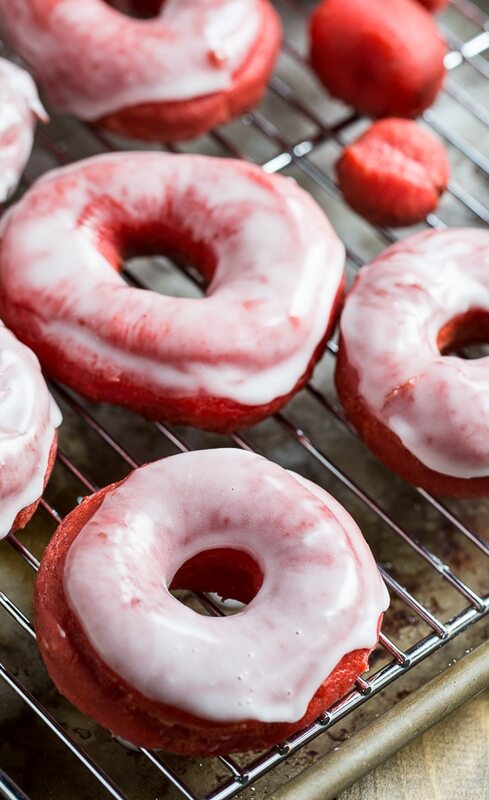 Use a 3-inch round cookie cutter and a small round cutter to cut donuts. You can use the small round cutter to make more donut holes out of the scraps. Carefully slide a few donuts into the oil. Fry for 35 to 45 seconds and then flip over. Cook the second side about 30 seconds and then place on a rack or a paper towel-lined baking sheet. For glaze, combine confectioners' sugar, milk, and vanilla extract in a bowl and whisk until smooth. Drizzle glaze on top of dounuts. This entry was posted in Breakfast and tagged donuts, doughnuts, red velvet, Valentine, Valentine's Day. Bookmark the permalink. Worse recipe ever not even sweet plus dosent taste like chocolate either. Just taste like sweet flour. this recipe did not work at all. it didnt tell me when to add in the water with the yeast and i also had to knead in the mixer far longer than 8 minutes and i still didnt get a ball of dough i could pick up. Thank you SO much for sharing! I’m so glad you made these – I can’t tell you how many I ate. It would be embarrassing. 🙂 Gotta love donuts!! 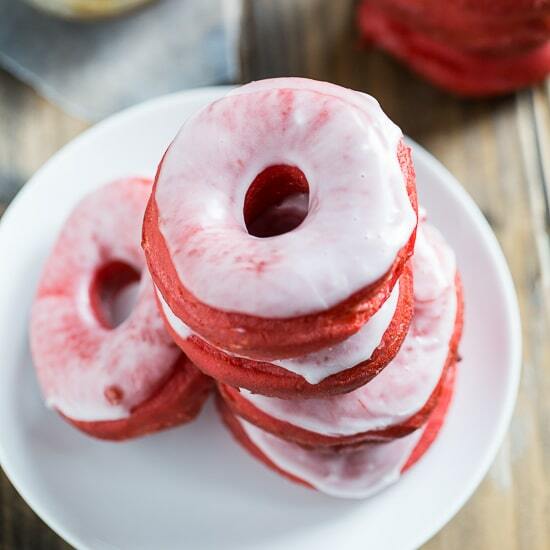 These red velvet donuts are gorgeous, Christin! I love the bright red and the glaze looks incredible! These are perfect for Valentine’s Day! This is so gorgeous. You seriously knocked this out of the park. What a great idea for Valentine’s Day. Love them. Red velvet is perfect for Valentine’s Day! 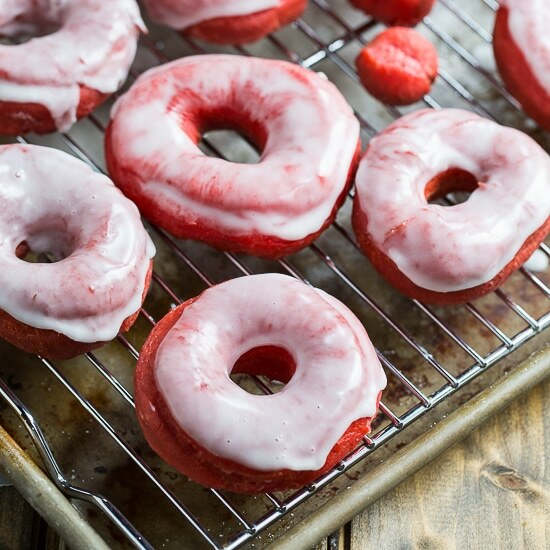 These donuts look amazing, Christin! And I love that glaze, too. Gorgeous! This is an awesome twist to red velvet cake. What a perfect Valentine’s Day breakfast!